In order to differentiate between the two, taxonomists have assigned a sub-order for butterflies, called Rhopalocera, while moths belong to sub-order Heterocera. Both of them undergo a larva stage, a pupa stage, and finally, metamorphosis into an adult butterfly or moth. Even though they look alike, butterflies and moths have many differences. The first difference deals with the antennae. Butterflies have thin antennae which are rounded at the end part. On the other hand, moths possess thick, feathery antennae. The second difference has to do with wing structure. Moths have an additional wing structure called the frenulum. The frenulum is a thin strand which connects the hindwing and the forewing. The most obvious difference between butterflies and moths are their wing colors. Butterfly wings are bright in color, while moth wings are darker. It’s common to see yellow, white, and green-colored wings on butterflies. 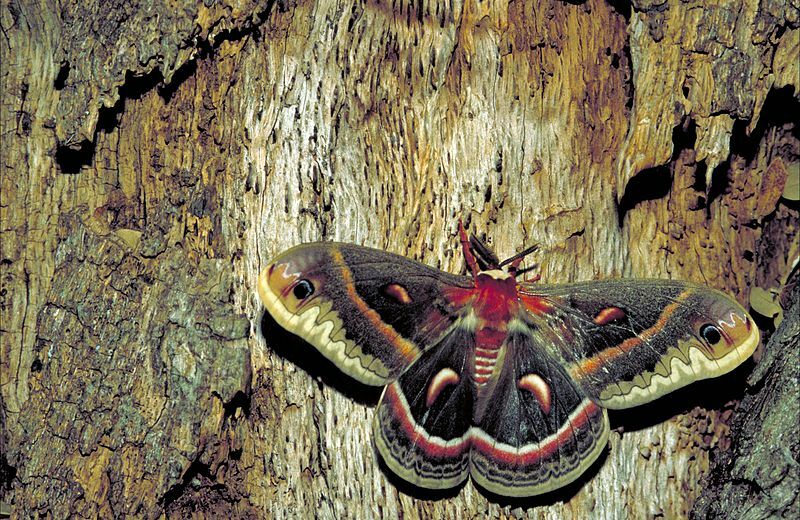 But on moths, their wings are limited to darker colors such as brown, black, or grey. The reason for such coloring lies in the fourth difference: butterflies rest at nighttime, and are active during the day, while moths rest at daytime, and are active during the night. Moths possess darker wing colors to help camouflage them from predators while they lie in rest state during the day. Furthermore, butterflies have fine wing scales, as compared to large wing scales of moths. The fifth difference between butterflies and moths lies in their body structure. Butterflies have thin thoraxes and smooth abdominal structures, whereas moths tend to have stout, hairy body parts. The sixth difference has to do with their resting positions. Butterflies rest with their wings folded above their backs. Moths, on the other hand, either spread their wings wide. Some species of butterflies and moths, however, do not follow this trend. The final difference is based on how butterflies and moths spin their cocoons. When undergoing metamorphosis, the pupa of a butterfly, also known as chrysalis, is exposed. Moth caterpillars spin silky cocoons, and their pupa is hidden inside this cocoon. Take note of all these important morphological differences if you want to effectively discern butterflies from moths. Perhaps the best distinguishing factor between butterflies and moths would be their active time. If you’re looking to catch butterflies for your butterfly garden, then it would be ideal to hunt for them during daytime, when they’re flying about freely. If, however, you want to add specimens for your moth collection, you should hunt them at night time, or you can also look for moths during the day, when they are resting. 1. Moths and butterflies belong to the same Order, Lepidoptera. However, they are classified under different sub-orders: Rhopalocera for butterflies, and Heterocera for moths. 2. Moths and butterflies have seven morphological differences. 3. The first difference is based on antennae features. 4. The second difference is based on wing structure. 5. The third difference is based on wing color. 6. The fourth difference is based on their active cycles: night time for moths, and day time for butterflies. 7. The fifth difference is based on the size and quality of their body structures. 8. The sixth difference is based on their resting positions: wings folded and held back, for butterflies, and wings spread for moths. There are exceptions to this trend, however. 9. The final difference is based on their pupa stage. Celine. "Difference Between Moths and Butterflies." DifferenceBetween.net. September 25, 2013 < http://www.differencebetween.net/science/nature/difference-between-moths-and-butterflies/ >.